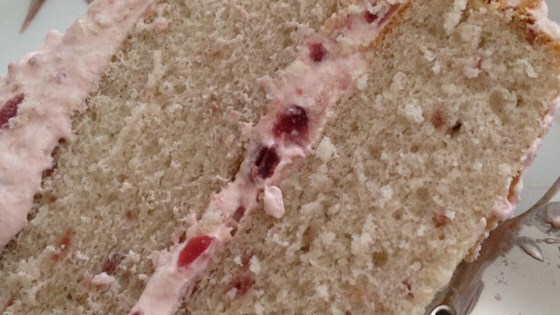 "This is a wonderful moist and full bodied cake. The frosting is creamy and very colorful." Preheat oven to 350 degrees F (175 degrees C). Grease and lightly flour the bottom and sides of two 9 inch round cake pans. In a large mixing bowl combine the cake mix, egg whites, water and cranberry apple sauce. Mix on low speed until batter is moist. Then mix on medium speed for 2 minutes. Pour batter into the prepared pans. Bake cake at 350 degrees F (175 degrees C) for 30 to 35 minutes. Cake is done when a toothpick inserted near the center comes out clean. Cool cakes on wire racks in pans for 10 minutes. Remove cakes from pans and let finish cooling on racks. To Make Frosting: In a medium sized bowl, beat the softened cream cheese, sugar and 1/2 of the whipped topping until smooth. Fold in the cranberry sauce and the remaining whipped topping. Refrigerate frosting until chilled. When cakes have cooled, frost the center and top of cake only. The frosting will be very soft. This recipe was easy, but the presentation was a huge disappointment. The frosting was much too soft to support the cake and went all over the place. Water ingredient edited by the allrecipes staff on 1/14/2008. Recipe is incomplete, no mention of water until directions. Frosting is soup, not "creamy or soft"